Father's Day is just around the corner, and just like last week, I am stuck for idea's on what to get my dad for the special occasion! My dad has six children, there's Dean who's the oldest, then Paul, then Paula, then Chelsea, then me - Jade and then the youngest Jamie and every year for every occasion, our dad tells us to buy him socks! Socks of all things! They're relatively quite cheap and not really something you gift as a present are they? It's what my dad wants though and it's what my dad gets, along with loads of other presents, because as much as he tells us not to waste our money on him (such a silly thing to say because we're not wasting money at all, we're gifting the man who raised us and what a wonderful job he done) we still buy him presents and make sure we include at least one pair of socks! If you do the calculations for Christmas, my dad's birthday and Father's Day, that's 3 events x 6 kids, that's at least 18 presents including at least a pair of socks just off of his kids throughout the year, but its very rare my dad gets just one pair from us each, we normally get him like a five pack so let's do the calculations again, 6 (kids) x 5 (pairs of socks) = 30 pairs of socks! Then when you times the 30 by 3 (Christmas, Birthday and Father's Day) that's 90 pairs of socks throughout the year just from his children alone! That's a whole lot of socks, and do you know where my dad keeps them? Within three draws in his chest of drawers, three draws just for socks is silly, beyond silly! Besides, with the cost of clothing these days, for a pack of five decent pairs of socks, you can spend your money on a different article of clothing, such as T-Shirts, because that's what I'm getting my dad this year! 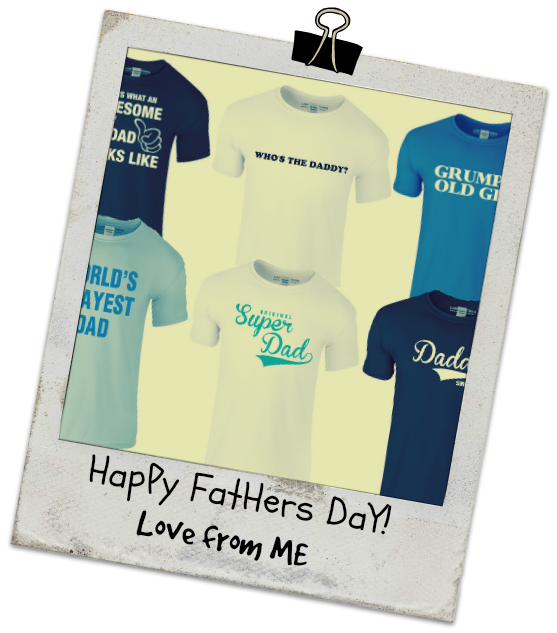 I've been having a look at T-Shirts online all morning and have found a great selection over at Lush T-Shirts for Father's Day Tees! There's at least three I'd love to see my dad wearing! My dad is a big part of my life, and he's a whole lot of characters rolled into one, I think there's a T-Shirt here to suit every part of his personality, it's just a shame he couldn't wear all three at once! The Grumpy Old Git one is just for humour purposes, my dad isn't grumpy at all, although that may be a different scenario if he doesn't get his morning cup of coffee! Just kidding in case you're reading dad! So I'm putting forward to this suggestion to my brother's and sisters, we can't keep continuing to buy our dad 90 pairs of socks a year, nor could we do it with tops either, or any other clothing item, but we could divide the buys between the six of us, and actually see the clothing items we do buy him, we rarely see his socks as he's always got his trousers and shoes on when we go to visit him or if he visits us! I'm also going to suggest to my dad that with any brand new and unopened socks, he should donate them to a homeless shelter, I read in a newspaper the other day that socks are one of the most essential things homeless people need, but the least thing to be donated! We've got winners all round, dad gets to have a sort out and helps people in need! P.S - If you love the look of these T-Shirts like me, and want to drop a hint to your children to get you one or a few for Father's Day, why not print off a collage and post it to your notice board? Or even treat yourself to a top or two (and maybe three or four! ).